Apple has reportedly notified resellers that the white polycarbonate MacBook is now officially classified as "End of Life" and has been discontinued. AppleInsider was first to report last year that the white MacBook would be phased out. A day later, Apple pulled the white MacBook from its consumer-facing website. The Cupertino, Calif., company then announced that the laptop would only be available to educational institutions. MacRumors reported on Wednesday that Apple has stopped even those sales and notified resellers that the MacBook is now classified as "End of Life." The MacBook was Apple's entry-level notebook for years, but it faced internal competition in 2010 with the release of the 11.6-inch MacBook Air, which also started at $999 and was an instant hit. Apple introduced the MacBook in May 2006 during the transition from PowerPC to Intel processors. 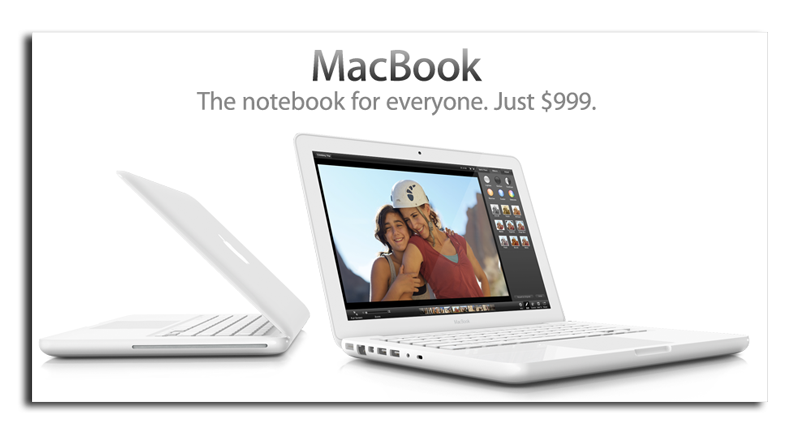 In 2008, it temporarily received an aluminum makeover, but that machine was later rebranded as the 13-inch MacBook Pro. Apple released a unibody polycarbonate design in 2009 that remained until the product was discontinued last year. Apple promoted the MacBook as "the notebook for everyone" before it was discontinued.